Follow blue floor arrows to locate the consultants clinic. Turn onto Leopardstown Road. Pass the Leopardstown Racecourse entrance (on left) and travel onto the Leopardstown Roundabout. Take third exit on the Leopardstown Roundabout onto Burton Hall Road (visible on entering the roundabout, stay in the left lane) Follow Burton Hall Road down to T-Junction and turn left onto Blackthorn Road. Continue on Blackthorn road to almost end of the road. There is an entrance to Beacon Court/ Beacon Clinic/Beacon Hospital underground car park. This is the only available entrance. Take parking to the right of security hut; follow sign to the Hospital pay and display parking area. Walk to stairway/lift (visible to the right, just in front of you) on entering the car park. Take lift/stairs up one level, into Beacon Concourse and walk to revolving door to your right (to the right of the concourse shop). You are now in the Beacon Court. Walk straight along the Court; note an exit sign on your right, to the Beacon Consultants Clinic. Walk out into avenue and enter the Beacon Consultants Clinic. Beacon Dental Clinic is located in suite 1 & 2 on the third floor. Exit the M50 Southbound at the Dundrum & Sandyford Exit 13. Travel down the ramp onto the roundabout. Take the 3rd exit off the roundabout, following the signpost for Sandyford. Follow the road along (it veers to the left), stay in the right lane and travel up to the traffic lights. (The Beacon Consultants Clinic can be seen on your right) At the traffic lights you should be in the right hand lane and take the right hand turn. 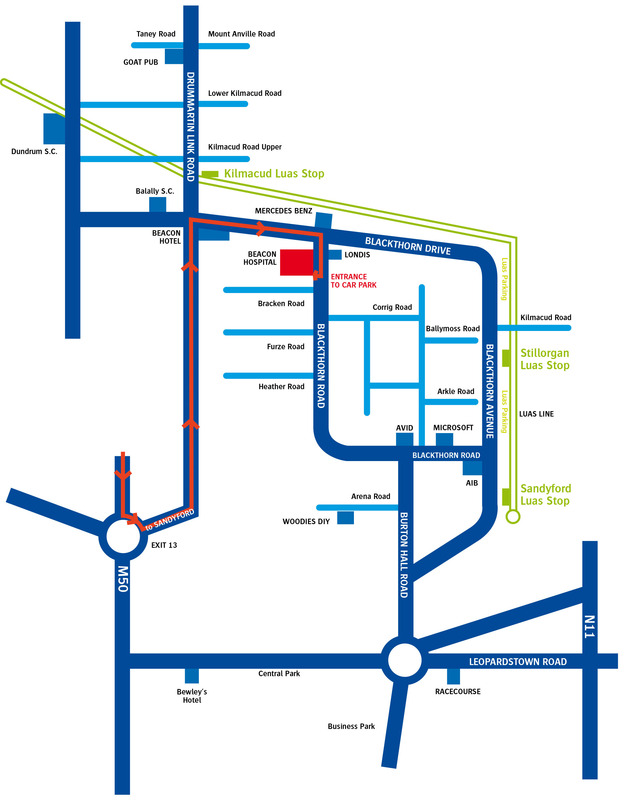 Take the first turn right (passing the Beacon Hotel) onto Blackthorn Road (there is a set of traffic lights at this junction) Immediately turn right into the Beacon underground car park, take parking to the right, HOSPITAL PARKING and follow signs to visitor parking. There is a pay and display parking area with a € 2.00 hourly parking fee. Walk to stairway/ lift visible on entering the car park. Take lift/ stairs up one level. Exit into Beacon Concourse and walk to revolving door to your right (to the right of the concourse shop). You are now in the Beacon Court. Walk straight along the Court; note an exit on your right, to the Beacon Consultants Clinic, exit the court. Beacon Dental Clinic is located in suite 1 & 2 on the third floor. Leaving the Luas at the Kilmacud Stop take a left and continue straight as far as the traffic lights. At the traffic lights turn left on to Blackthron Drive (Beacon Hotel is in front of you), a short distance down this road take the first right on to Blackthorn Road. Continue down this road to the first right Bracken Road. The Pedestrian entrance to the Beacon Clinic is by a flagged entrance, with a water feature, for Beacon Court. Enter through the gate and walk up the Avenue to Beacon Consultants Clinic, on the left at the end of the Avenue. Beacon Dental Clinic is located in suite 1 & 2 on the third floor. On entering the underground car park keep right and follow the signs for Visitor Parking. Note a glassed elevator and stairs on the right in front of you as you enter the car park. Walk to stairway/ lift visible on entering the car park. Take lift/ stairs up one level. Exit into Beacon Concourse and walk to revolving door to your right (to the right of the concourse shop). You are now in the Beacon Court. Walk straight along the Court; note an exit on your right, to the Beacon Consultants Clinic, exit the court. Beacon Dental Clinic is located on the 3rd floor, suite 1 & 2.